Production version of Santa Cruz concept could be offered with electrified drivetrain. 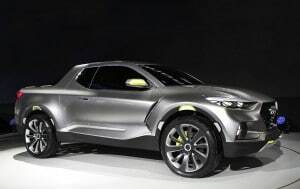 Hyundai could sorely use a production version of the wildly popular Santa Cruz concept first shown in 2015. Hyundai has reconfirmed plans to put into production a version of the wildly popular Santa Cruz concept truck that was unveiled at the North American International Auto Show in January 2015. But Hyundai officials are hesitating to use the term, “pickup” to describe the compact model, preferring to think of it as an “open bed” vehicle aimed at Millennials and other urbanites who “might need to occasionally toss their sports gear in the back or help move a friend’s dresser,” a well-placed source told TheDetroitBureau.com. Expect the production model – which many expect to retain the Santa Cruz name – to reach the U.S. market by the 2020 or 2021 model-years. And while some key details are still being finalized, the Korean carmaker is giving strong consideration to offering an electrified powertrain option which could range from a conventional hybrid to a full battery-electric system, sources confided. Hyundai spent the first half of the decade on a roll. Products like the midsize Sonata and compact Elantra sedans won rave reviews for styling and helped change the perception of a brand long known for less aggressively styled “econoboxes.” The maker’s rapid improvements in quality also defied conventional wisdom, Hyundai just two months ago besting traditionally luxury leader Toyota, as well as the Japanese maker’s upscale Lexus brand in the J.D. Power and Associates Initial Quality Survey. But sales have slipped over the last two years, in part due to Hyundai’s traditional dependence on passenger cars, rather than the pickups and SUVs that now account for nearly two-thirds of the American new vehicle market. Its two utes, the Santa Fe and Tucson, have continued to build momentum. 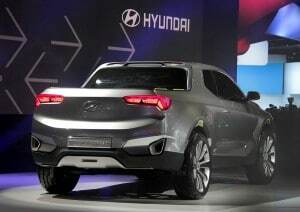 Before being ousted in a manufacturing shake-up earlier this year, former Hyundai Motor America CEO Dave Zuchowski indicated a range of new light truck models had gotten the go-ahead from corporate headquarters, including new SUVs, as well as the Santa Cruz project. Hyundai reconfirmed that on Tuesday. While official details are not being discussed, TheDetroitBureau.com was able to track down a number of specifics. As with the Tucson, Santa Fe and newer SUVs in development, the Santa Cruz will eschew the classic truck-like, body-on-frame platform used by most of today’s pickups. Only the newly revived Honda Ridgeline opts for a car-like crossover platform at the moment. As with the Santa Fe concept, Hyundai plans to add some innovative features that will enhance the flexibility of the production Santa Cruz, though sources would not say if that will include one of the concept pickup’s most talked-about details: an extendable bed. Could the Santa Cruz fill a yawning gap once populated by cheap pickups like this '70 Chevy Luv? That approach would allow for a compact truck’s box, when extended, while maintaining a subcompact footprint, otherwise, a plus in targeting urbanites with limited parking space. The pickup will target Millennials and other young and active buyers who might like a little extra room for “stuff,” but not as much as a traditional compact or full-size pickup would handle. Cargo capacity would be well under that of current quarter and half-ton models and towing capacity would be modest, at most. Think a couple kayaks, maybe a jet ski or snowmobile, but certainly not a boat. As for powertrains, Hyundai has already migrated to a nearly all-four-cylinder line-up, what with the upcoming end of production of the full-size Azera sedan. But the automaker also has begun what is expected to be an increasing push into alternative energy space. Its Ioniq model is offered with optional hybrid, plug-in hybrid or pure battery-electric drivetrain options. Earlier this month, the maker announced plans to ramp up its electrification efforts while also readying a new, hydrogen fuel-cell-powered SUV. Some form of electrified option is under study for the Santa Cruz, though it is unclear if a final decision has been made. With plug-and-play alternatives available, Hyundai may wait closer to production to finalize that decision, watching to see how the market for battery-based vehicles evolves. “New benefits like electric and autonomous driving have been mostly focused on sedans and luxury cars. It’s only a matter of time before they translate to trucks and likely have a lot more practical, every day benefits beyond those just driving in traffic,” said Eddie Yoon, a former partner in the Cambridge Group and founder of the think tank, EddieWouldGrow. The decision to target Millennials who might normally not consider pickups makes sense, said one Hyundai source, “because cracking into the pickup market is extremely difficult. In the full-size market, the recently redesigned Nissan Titan and Toyota Tundra have been able to scratch out just a 7% combined market share, the last market segment Detroit overwhelmingly dominates. In the midsize market, the Toyota Tacoma has long been dominant, but largely because domestic makers largely walked away until recently. Midsize trucks generate barely 10% of the volume of the full-size segment, but volumes have been on the rise as competition increases. General Motors brought out two versions, the Chevrolet Colorado and GMC Canyon, several years ago, Honda returned with the Ridgeline after a several-year absence, and Toyota last year updated the Tacoma. Ford also is set to return with the reborn Ranger, Nissan soon to update its Frontier. And Jeep is about to return to the pickup market, as well. The Hyundai Santa Cruz will be smaller than all of them. Pricing also will likely play into the ultimate appeal. 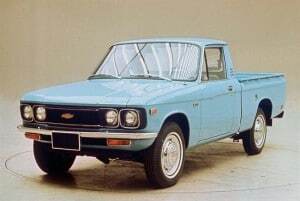 The Koreans apparently would like to launch the pickup in the $20,000 range, though upscale versions could push closer to $25,000 and even $30,000 with a battery option. That could position the Santa Cruz to become the long-missing replacement for the cheap imported pickups that were wildly popular when Baby Boomers were just coming of driving age five decades ago. This entry was posted on Tuesday, August 22nd, 2017 at and is filed under Automobiles. You can follow any responses to this entry through the RSS 2.0 feed. Both comments and pings are currently closed. Small beads of sweat forming on Buddy Hackett’s brow. I’m hoping that the Santa Cruz will come out by late 2018 as a 2019 model. What an awesome looking model vehicle!